Jon, a very nice look and an interesting way to highlight the value of skirmishers and differentiating from line by allowing fire. Good thread. Thanks. It is a scale thing. Once you get to 1" = 100 yards the really effective killing range of the musket is only about 100 yards itself so only 1" on the battlefield. It makes a lot more sense to me to have that close range fire as part of the attack resolution. So units cannot move within 300 yards without actually launching an attack. Using the opposed dice rolls allows a number of results from such an attack. Basically the higher total shoots last with double dice (this sounds counter intuitive but basically the side that shoots last shoots from the closest range and thus has more effect). For Skirmishers the base represents the formed reserve location so actual men would be operating up to 200 yards advanced of that and shooting 3-400 yards - hence they can perform long range shooting up to 6" range. Artillery range is about 1200 yards max so 12". Canister is 6" range. I have three more bases of infantry to paint then I am waiting on an order from Baccus for some French opponents. Need to finish their bases and paint their pom poms. I think I'm getting better and understanding a little more what to do with the 6 mm chaps. I have to say I was very disappointed with my efforts on these until I painted the white fronts and suddenly they were transformed into proper little French men. I told myself I wasn't going to paint the Shako chords on the grounds that they were often removed in battle but once I started I couldn't not paint them. As a bonus it also helps differentiate them from the Austrians further and it actually didn't take too much longer. 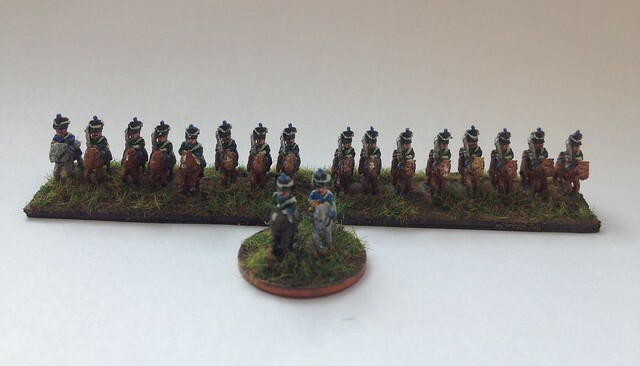 The first French cavalry: some Chasseurs. 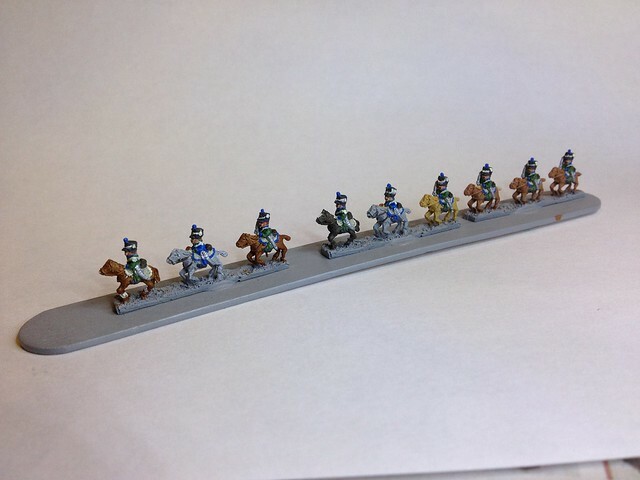 Cavalry are definitely time consuming. I think I painted the musician trousers the wrong colour as well - should be green. Will touch up when I do the other strip. 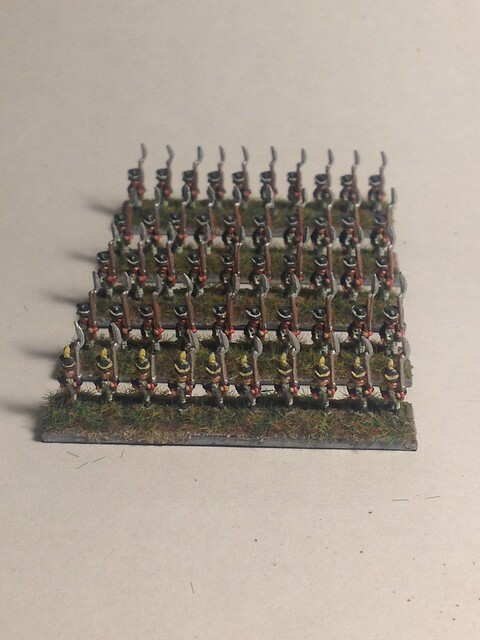 Here are the completed Chasseurs - just need to paint the base and grass it. I may add a few more markings to the horses as the white blazes, etc really seem to bring them to life. 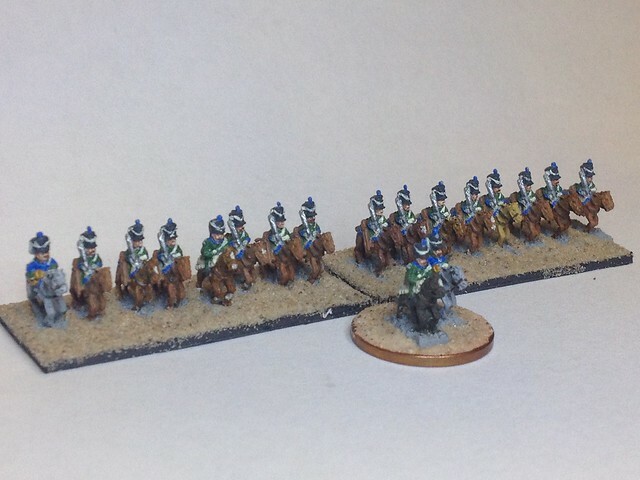 Might try to tackle the Cuirassiers next or go back to another unit of infantry. 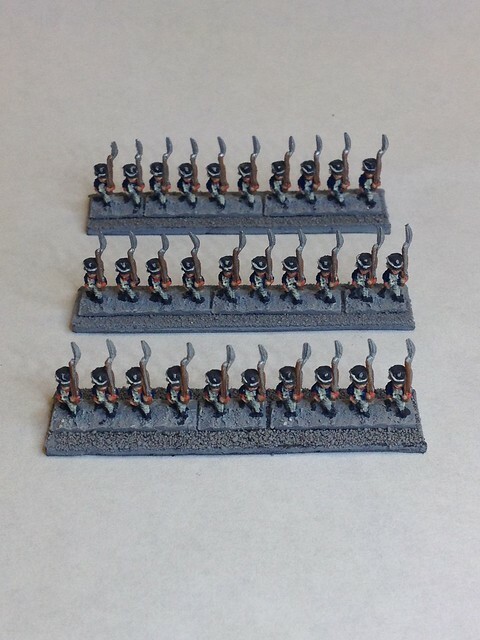 Need to order some more elite infantry for the Grenadier Companies. Still pottering along with this. Painted a few more Frenchies and had another test battle. 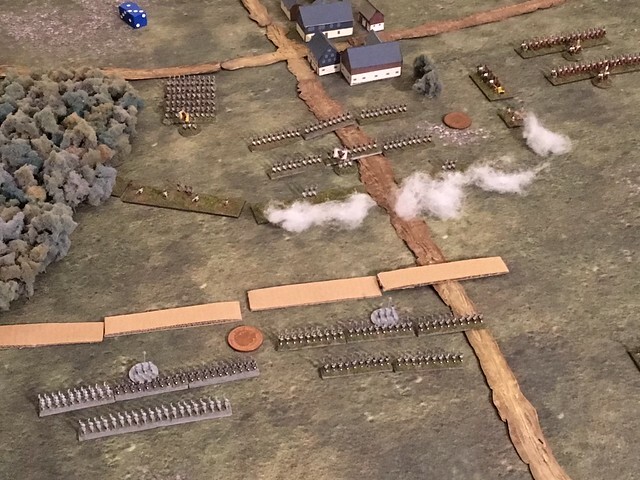 An Austrian rear guard attempts to delay the French. 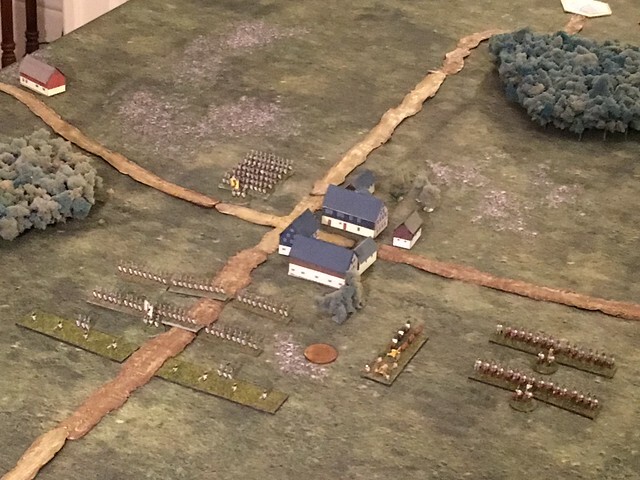 A disastrous cavalry charge by the Austrian horse (it wasn't a good idea to begin with but a roll of snake eyes saw it turn into a rout) meant the Austrian left wing collapsed. Despite a valiant defence by the Austrian infantry they were cut off and destroyed. 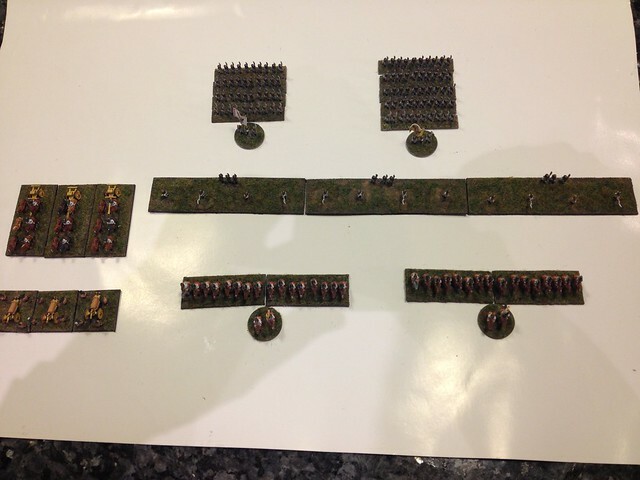 The French Horse captured the Austrian Deployment Point so they had nowhere to run to. ...Despite a valiant defence by the Austrian infantry they were cut off and destroyed. 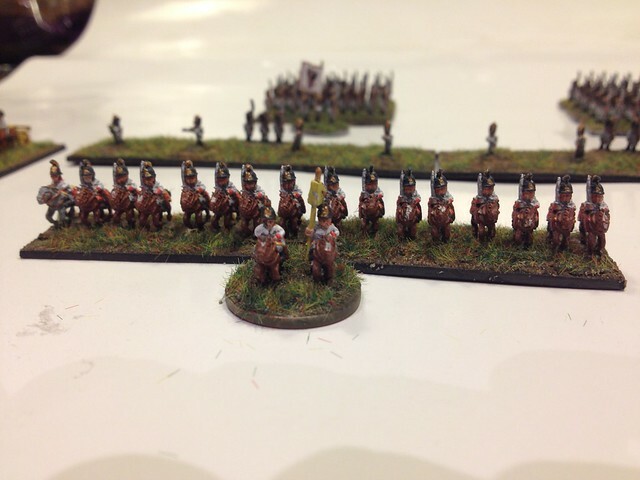 The French Horse captured the Austrian Deployment Point so they had nowhere to run to. Hmm, that sounds a trifle drastic. In actual rule terms their force morale collapsed to zero. I have shamelessly stolen the Force Morale rule from Chain of Command. So as units are lost force morale reduces. Once it reaches zero the battle is lost. OK, that goes down easier. Friends of mine call pinching rules "paying them the ultimate compliment". Differences between Lion Rampant and Dragon Rampant?